The dense mountain forest of Frozen Head State Park spans some 24,000 acres of vast timber plateau—an idyllic place to set up camp for a night or longer. With more than 30 sites ranging from primitive to backcountry, campers have an array of options for overnight stays. Frozen Head State Park and Natural Area is located near the beautiful Cumberland Mountains in a somewhat rugged range known as the Crab Orchard Mountains. On offer at this park are roughly 24,000 acres and 50 miles of trails in which to play in. While most of the crowds are off exploring in the Smokies, Frozen Head sits back and waits for the lucky few to come discover what a secret gem it truly is. There's something for everyone in this expansive park. During most any visit to Frozen Head, you will find yourself alone on the trail. Because of the somewhat "out of the way" location, only about an hour away from Knoxville, this park is a great getaway for a weekend in the mountains. The trails here are very well maintained and often give views that would rival any trail in the Smokies, especially if you're looking for quality waterfalls and mountain streams.The roads in the park are limited, so to really see anything you have to set out on foot!Frozen Head has several notable waterfalls along its miles of trails, and these falls are truly magnificent after a good rain. To have a great waterfall adventure, head to this park during a wet period. If you stay straight on the park road until it dead ends at a trailhead (heading towards the Debord and Emory Gap waterfalls) it is well worth the 3 mile round trip to see them both full-force. The trail follows the North Prong of the Flat Fork and gives hikers a waterfall to look at after a quarter mile or so (even more when it has just rained). For a short hike in Frozen Head (with options to make longer) this is a great choice.Although this park is not close to the Smokies, it is in the same area as the Obed Wild and Scenic River. This provides users with options to hit both locations for a beautiful weekend in the mountains, featuring rushing rivers and streams and gorgeous ridge-line views over the mountains. If you leave after work on Friday, two perfect mountain days are only an hour away, so bring your camera and boots and set off to Frozen Head and the Obed! Anglers enjoy fishing for trout in the Flat Fork Creek. Mountain bikers aren't technically allowed on the single track trails in the park, but they can enjoy 9 miles of fire road that take them to the highest point in Frozen Head: none other than Frozen Head Mountain, a 3,324 foot peak that's normally covered in ice and snow in the winter (hence the name). And hikers, backpackers, and trail runners of all skill levels will certainly find something to suit their desires on one of the 15 plus trails. 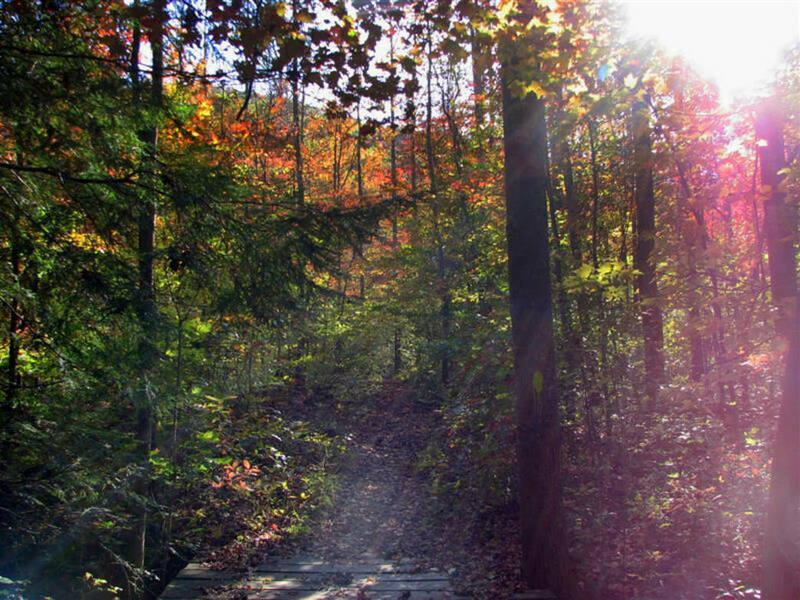 One particularly popular option for hikers is the Chimney Top Trail, which is a strenuous 6.6 mile trail that takes its visitors to a rock formation known as Chimney Tops where they'll be treated to some really spectacular views of the surrounding area. To find the trailhead you are looking for, consult this map from the park website. The park does close at dusk, so make sure you are headed back to the car with plenty of time. If you are camping, check in at the Visitor Center (on your right on the way in) to get a permit and register your car.Make a weekend of it and experience all that you can at this impressive, underrated park. You'll be glad that you did.